Movies released in January are generally junk! Studios dump a majority of bad movies year to year in January and February and the result has made general audiences shrug off those releases. "The Book of Eli" is set for a January 15th release, but everything I have seen to date on the Hughes Brothers directed film makes me wonder, why the hell is it releasing in January. Denzel Washington and Gary Oldman in a post apocalyptic future, in January? The movie looks gritty, violent and the imagery is intense and just what I would expect from a apocalyptic tale. The brand new trailer released this week is more of what we saw in the previous trailer, but instead adds a bit more character development to the supporting cast. The trailer also boasts the films action, which looks to be executed fairly well. My only initial gripe with this flick is Mila Kunis, who has yet to prove she can handle anything other than comedy. 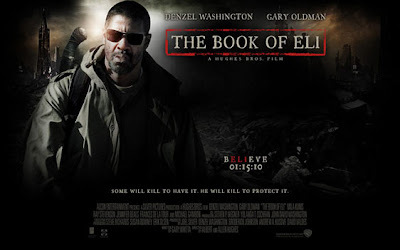 Enough of my thoughts, checkout the new trailer for "The Book of Eli" below and let me know what you think.